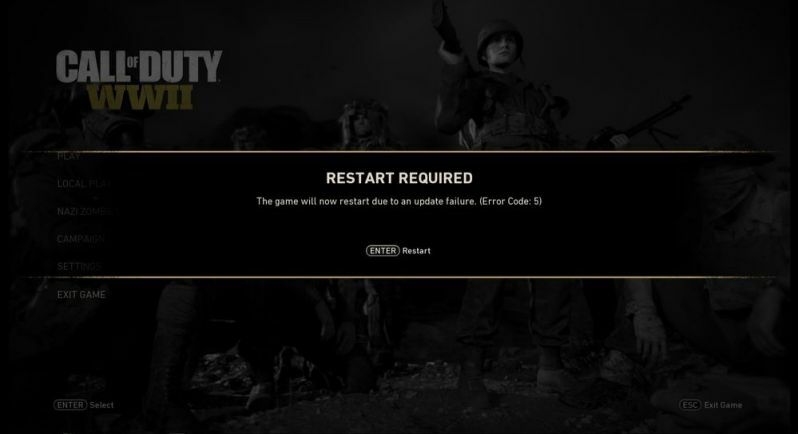 Activision has confirmed that they are aware of Call of Duty WW2 Error Codes 1, 3, and 5 issues. Some players are facing this issue where they see ‘The game will now restart due to an update failure. (Error code: 5).’ The game developers are working on a fix for this bug. For now, Sledgehammer Games suggests trying the following if you are receiving the error. Please do a full power cycle on the gaming console and /or network modem/router. Set your NAT type to OPEN. Avoid Wi-Fi and instead, use a connected cable. A new patch will release soon to fix this issue.